How do you start one for your family? First, choose the right space – look carefully at the most-used family entrance or possibly an area in the kitchen (since it’s usually the busiest room in the house). Your Home Command Center should be the first place everyone sees when they leave in the morning and the first place they see when they walk back in the door. 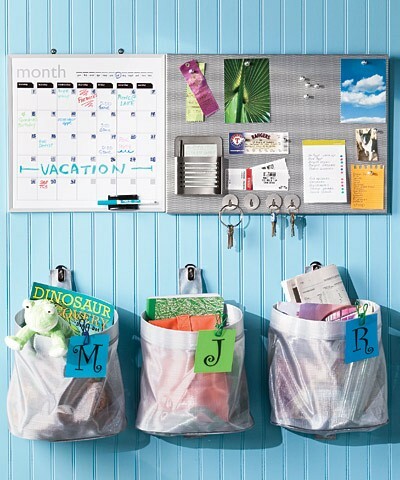 Second – Start simple with an open wall area and hang a corkboard, chalkboard and or a whiteboard. Include the family calendar, school lunch menu, emergency numbers and important contacts for quick reference. This is also a great place to have a household chores checklist and leave space for family members to leave notes and reminders. Start small and let this area grow with your family, you may expand it later to include folders, key hooks, an area for book bags, backpacks or eventually a home computer and have your house go digital. If you can, include the whole family. Make a game of taking young children to the calendar and talking about what’s coming up. 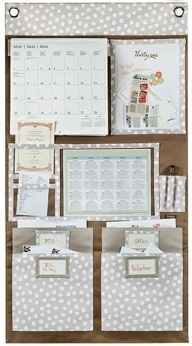 Put stickers, play dates and fun events on the calendar so they get in the habit of wanting to look at it. As they get bigger you can include chores and make a checklist with stickers so that they can mark them off and feel a sense of accomplishment when they’re all done! This is the family center, not just a one-way communique from parent to child. Encourage kids to leave messages for you and have them write on the calendar if there are changes in practice times, school events, or parties. This is a place for communication to begin and expectations (chores, homework) to be defined. Make it a positive and surprise them with a “get out of chores free” card or a treat; they’ll look forward to checking the board even when you aren’t there. A simple calendar and a single place for communication can save time, energy and avoid a lot of frustration. The Home Command Center is where information is kept in one location for the benefit of ALL. Need help building your own Home Command Center? Feel free to email or phone me. P.S. – Later I’ll share tips and templates for gathering and keeping critical information you may want to include in your Home Command Center. Like your idea of the command center. Wish I would known that when I had kids at home!